A synthesis of findings from neuroscience, psychology, and behavioral biology has been recently used to show that several key features of cognition in neuron-based brains of vertebrates are also present in bee-based swarms of honey bees. Here, simulation tests are administered to the honey bee swarm cognition system to study its decision-making performance. First, tests are used to evaluate the ability of the swarm to discriminate between choice options and avoid picking inferior “distractor” options. Second, a “Treisman feature search test” from psychology, and tests of irrationality developed for humans, are administered to show that the swarm possesses some features of human decision-making performance. Evolutionary adaptation of swarm decision making is studied by administering swarm choice tests when there are variations on the parameters of the swarm’s decision-making mechanisms. The key result is that in addition to trading off decision-making speed and accuracy, natural selection seems to have settled on parameters that result in individual bee-level assessment noise being effectively filtered out to not adversely affect swarm-level decision-making performance. The “collective intelligence” or “super-organism” perspectives have been used for both animals and humans to discuss fully integrated group functioning, especially group decision-making (Hölldobler & Wilson, 2008, 1990; Levine et al., 1993; Franks, 1989; Seeley, 1989, 1995; Hinsz et al., 1997; Wilson, 2000; Camazine et al., 2001; Surowiecki, 2004). But, how does a group of organisms implement a “mind” that supports group decision-making? Recently, this question has been partially answered. Viewing the honey bee super-organism as a single decision-maker, a detailed explanation of the honey bee nest-site selection process has been used to identify the key elements and functional organization of swarm cognition (Passino et al., 2008). It was shown that the swarm has identifiable elements that correspond to neurons, action potentials, inter-neuron communications, lateral inhibition, short-term memory, neural images, and layers of processing (Kandel et al., 2000). Functional similarities to the networks of neurons that perform certain attention, perception, and choice functions (Gazzaniga et al., 1998; Kandel et al., 2000) in solitary animals were identified. It was shown that the swarm’s short-term memory (“group memory”) is on average a representation of the relative quality of the discovered nest sites that leads to good choice performance. Then, two basic properties of the swarm’s choice process were tested: discrimination (the ability to distinguish between nest sites of different quality) and distraction (the ability to ignore nest sites of inferior quality). 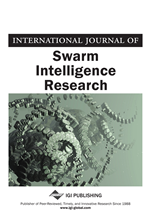 The focus of this paper is to analyze swarm decision-making performance and adaptation to provide additional evidence that bee-based swarms have a cognition process that shares key features with neuron-based brains. The key experimental work in the area of honey bee nest-site selection is in (Seeley & Buhrman, 1999; Camazine et al., 1999; Seeley & Buhrman, 2001; Seeley, 2003; Seeley & Visscher, 2003, 2004a). A number of models of the nest-site selection process have been published. First, there are the ODE models introduced in (Britton et al., 2002) to study the issue of whether bees make direct comparisons between the qualities of more than one nest in order to make a decision (which they do not). There is a discrete-time population matrix model introduced in (Myerscough, 2003). A simulation model that was validated for a range of experiments (those in (Seeley & Buhrman, 1999; Camazine et al., 1999; Seeley & Buhrman, 2001; Seeley, 2003; Seeley & Visscher, 2003, 2004a)) is introduced in (Passino and Seeley, 2006) and used to study the speed-accuracy trade-off in the choice process. In Perdriau and Myerscough (2007) the authors introduce a density-dependent Markov process model of honey bee nest-site selection and study the effects of site quality, competition between sites, and delays in site discovery. Next, the work in (Janson et al., 2007) introduces an individual-based model and studies the swarm’s scouting behavior and the impact of distance on choice. Ant colonies performing nest-site selection have some broad similarities to the bees’ nest-site selection process (e.g., a speed-accuracy trade-off), and corresponding models and simulations have been developed (Mallon et al., 2001; Pratt et al., 2002; Franks et al., 2003; Pratt, 2005; Pratt et al., 2005). Finally, note that recently a common framework was introduced to study the optimality of decision-making in the brain along with nest-site selection in both ants and bees (Marshall et al., 2009).